The blonde face with the blonde voice, the petite actress was born in Muncie, Indiana. She was best known by the name of Lucille Ball's The Lucy Show and Here's Lucy character, Mary Jane Lewis, which was derived from her own married name, as she was married to one of the show’s producers, Elliot Lewis, at the time. Her only son, Eric Zoller, died in the Vietnam War. Mary Jane Croft actually began appearing opposite Lucille Ball in 1957, playing Betty Ramsey in the original I love Lucy series. Mary Jane actually began her career as a highly respected radio actress, on radio shows like Lux Radio Theatre, One Man’s Family, and The Adventure of Ozzie and Harriet during the 1940s and 1950s. She also played opposite of Mel Blanc, as his girlfriend Betty on the radio program, The Mel Blanc Show, in 1947. She was able to play everything from lady judges and society dames to floozies and broad comedy parts. When television began to push radio out of the way, Mary Jane easily made the transition. 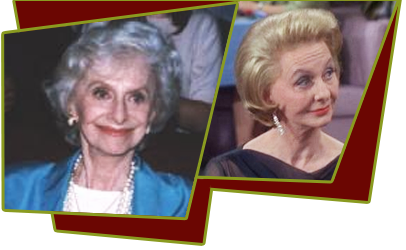 She began her TV career playing Miss Daisy Enright on Our Miss Brooks, and when The Adventure of Ozzie and Harriet moved to television, she returned to play Clara Randolph, a role she played for over ten years. She regularly appeared with two of Lucille Ball's comedian competitors, Joan Davis (I Married Joan) and Eve Arden (Our Miss Brooks), before lending her voice to Cleo the Dog on The People's Choice (1955-58). Mary Jane even provided that voice when the dog appeared on The Perry Como Show. Mary Jane had only worked once with Lucille Ball in a small part on radio's My Favorite Husband when she was tapped to play her first part on an I Love Lucy episode. Lucille liked her professionalism, and before long Mary Jane found herself playing a recurring role during the last season of I Love Lucy (1956-57), that of neighbor, Betty Ramsey. When Lucille moved on to other things, Mary Jane (who had by this time married Director/Producer Elliot Lewis) became a regular on The Adventures of Ozzie and Harriet. There she played Harriet's friend, Clara Randolph. Concurrent with her Nelson chores, Mary Jane again joined Lucille on The Lucy Show. When Vivian Vance left The Lucy Show after the 1964-1965 season, Croft became Lucy's new sidekick, Mary Jane Lewis. Croft had previously had a recurring role as Audrey Simmons during the show's early seasons set in Danfield, New York. Croft joined Lucille Ball again on her third sitcom, Here's Lucy, once again playing a kooky, shrill-voiced character named Mary Jane. The character remained until Ball decided to end Here's Lucy in 1974. Croft continued to act in television for several years after the end of Here's Lucy, reuniting once again with Lucille Ball in 1977 in the special, Lucy Calls the President. She also returned to radio for several episodes of Sears Radio Theater in 1979. She retired from performing after her husband Elliot passed away in the early 1990s. She died of natural causes in Century City, California in August, 1999. She was cremated, and her ashes scattered at sea.